Click to buy Rise of the Fiends! Rise of the Fiends (RotF, 2008) signalled the decline of the Pirates game. New “pokeships”alienated much of the player base and the set was smaller than most that came before it, with an abundance of slow ships. 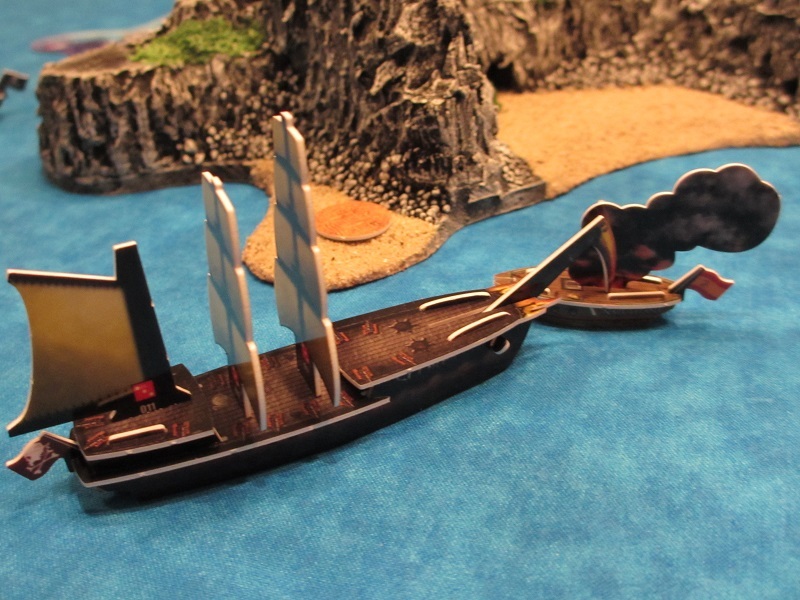 Only a few of the widely despised Scorpion ships were even produced, and the red islands didn’t make things any better. Interestingly enough a lot of the regular ships and crew were pretty decent, the saving grace for an otherwise poor set. You can find all of the game pieces in the Master Spreadsheet, and I’ve ranked the Top 10 here. – Art: 4/5. Very colorful ships and crew – many great, but some a bit over the top. Most of the larger ships are quite beautiful. Using different artwork for generic crew is cool, but it does make it a bit confusing and harder to use for new players. Actually one of the most interesting sets for artwork, but too much focus on the red theme was detrimental (mostly with the red island/terrain cards, which look truly disgusting next to any other set’s). I don’t like the cards either – the red and yellow looks great with SM and CC, but combined and brighter it seems unappealing for some reason. – Set Quality: 3/5. I’ve underrated this set many times, but it has a lot of interesting game pieces. However, there’s a bunch of mediocre stuff as well. Most ships are either slow or have small cargo holds, so it’s not a good set for getting gold at all. There are a few balance issues with the extremes of the set – mostly the San Cristobal and Blood Money being OP, while stuff like Merrow and some of the 1 masters should not have been made. – New Content: 1/5. I nearly put 0/5 and said “am I allowed to do this?”, but flotillas and the glow in the dark stuff just barely make up for the atrocity of scorpions and the Hostile/Loyal stuff. Scorpions are my least favorite ship type, though the sharks are up there as well. Only one of them stands out, while all the flotillas are usable and quite good. The Hostile/Loyal keywords feel like an unnecessary gimmick to lower point costs (Eternal for one point? ), though I do like when flavor text is part of the gameplay. The Turbine and Double Catamaran randomly thrown in at the end of the set really show that the game was completely coming off the rails at this point. The Turbine keyword is underpriced and weird from a historical perspective, while the Double Catamaran ship type is way too wide and big, not to mention awkward. Though the ship types weren’t new, I love the glow in the dark concept. = Overall: 11/20. Not one of my favorites, but the positives of the set are pretty cool. Get Rise of the Fiends here!